Mac and Cheese is a common staple in most people’s lives, often reminding us of our childhoods. In the United States, it’s actually celebrated every July 14th for National Mac and Cheese Day. Over the years, Mac and Cheese has been transformed, from the original cheese and elbow pasta combo to the limitless variations today that have toppings like bacon, jalapeños, vegetables, or even pesto. 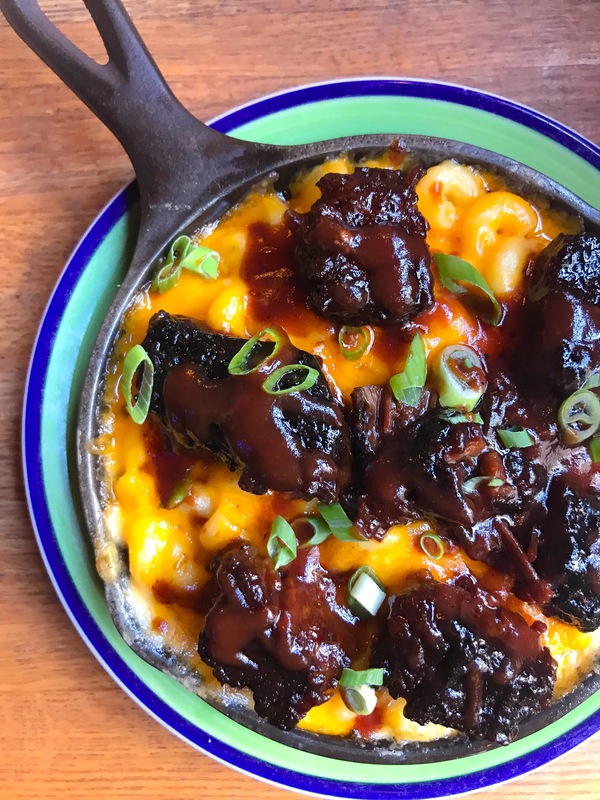 Every month, Jake Melnick’s Corner Tap in Chicago puts a creative twist on the traditional Mac and Cheese recipe. 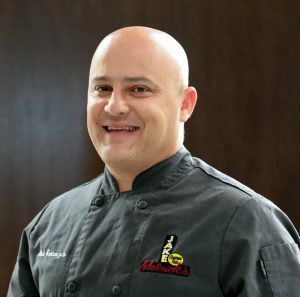 Executive Chef Nick Santangelo at Jake’s finds inspiration from seasonal ingredients to create the restaurant’s monthly Mac and Cheese special. Making over 100 pounds of Mac and Cheese a week, Chef Nick knows the secrets to making the absolute best version of our favorite cheesy pasta dish. Q: How would you describe Jake’s Mac and Cheese? Really creamy, cheesy goodness. We make the cheese sauce in-house, and we wait until we get the order to toss the noodles in it. Then, we heat it up in the oven to get the nice color and caramelization. We also add more cheddar on top. It is really good, fresh, and satisfying. 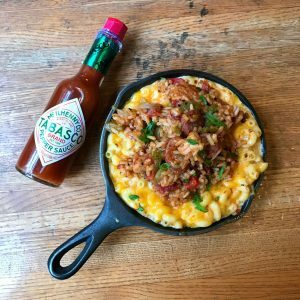 Q: What is this month’s (July) Mac and Cheese special? This month we’re doing a BBQ Spaghetti Mac and Cheese. It is similar to a sloppy joe mix, but we have brisket and pork in the dish instead. It also has onions, peppers, and spicy barbeque in it. 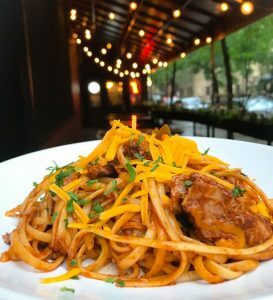 It is all tossed with spaghetti, cheddar cheese, and fresh parsley. It’s a really unique take on the traditional elbow Macaroni and Cheese. Q: What are your other Mac and Cheese specials? 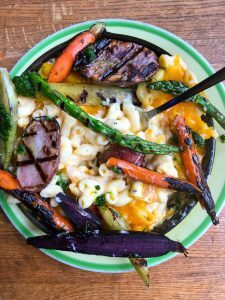 In the fall or spring, we have Mac and Cheese with fresh vegetables to lighten it up. In the past, we did a burrito Mac and Cheese where we rolled up the Mac and Cheese in a burrito. Another guest favorite is the pizza with Mac and Cheese on top. Q: Do you have any childhood memories associated with Mac and Cheese? My mom was Italian so her Mac and Cheese was more like baked pasta with red sauce. I paid tribute to my mom by making a Mac and Cheese special here at Jake’s that was similar to the one I grew up eating. We made a homemade Pomodoro sauce with spicy Italian sausage and then baked the pasta. Q: How do you think people like their Mac and Cheese here in the Midwest? I think for the most part, it definitely has to be really creamy and satisfying like a comfort food. I think that is what they are looking for in a dish, and that is what we have noticed at Jake’s. Q: Is there such a thing as too much cheese? There is probably never too much cheese. But, you do have to be careful when you melt the cheese on top. A little color and caramelization in it is good, but if it gets too much then it isn’t the most appetizing Mac and Cheese. There is a fine line. If you just make it fresh, and not overly dressed, it’ll be perfect. Half and Half- 8 oz. 1. Heat cream, half and half, seasonings, and butter in a pot over medium heat. 2. Bring to a simmer and whisk in Velveeta and cheddar until smooth. 3. Stir constantly or sauce will scorch.